Learn how to program with Python 3 from beginning to end. Python 101 starts off with the fundamentals of Python and then builds onto what you’ve learned from there. 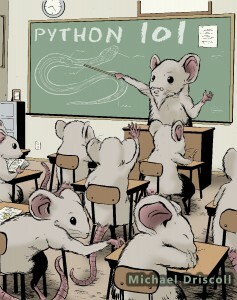 The audience of this book is primarily people who have programmed in the past but want to learn Python. This book covers a fair amount of intermediate level material in addition to the beginner material. This section will be a curated tour of the Python Standard Library. The intent isn’t to cover everything in it, but instead it is to show the reader that you can do a lot with Python right out of the box. We’ll be covering the modules I find the most useful in day-to-day programming tasks, such as os, sys, logging, threads, and more. You can get a free eBook copy of the book on Leanpub or purchase a copy from Amazon or Gumroad. You can also get a Paperback copy on Lulu. The book has also been made into a course on Educative where you will be able to run the examples. You can find it here. If you’d like to get a price break, you can use the following coupon: au-py101-interactive at checkout on Educative. © Copyright 2017, Michael Driscoll.